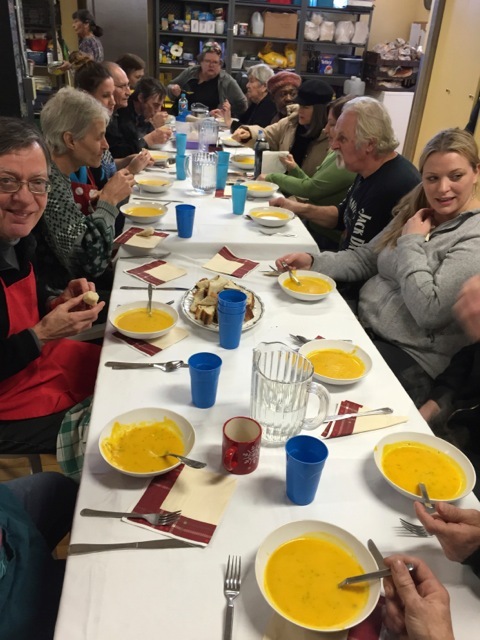 Once a month on a Friday night, Wendy Hepburn, Assistant Director with Citizenship and Multiculturalism, helps to organize a community meal at the Parkdale Food Centre in Ottawa. 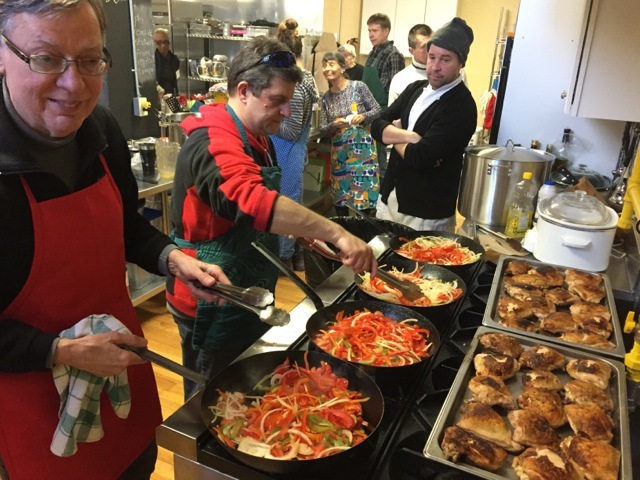 Community meals support the Food Centre’s goals to provide fresh, wholesome food to people in need, as well as teach members of the community how to cook healthy and delicious meals with simple ingredients. 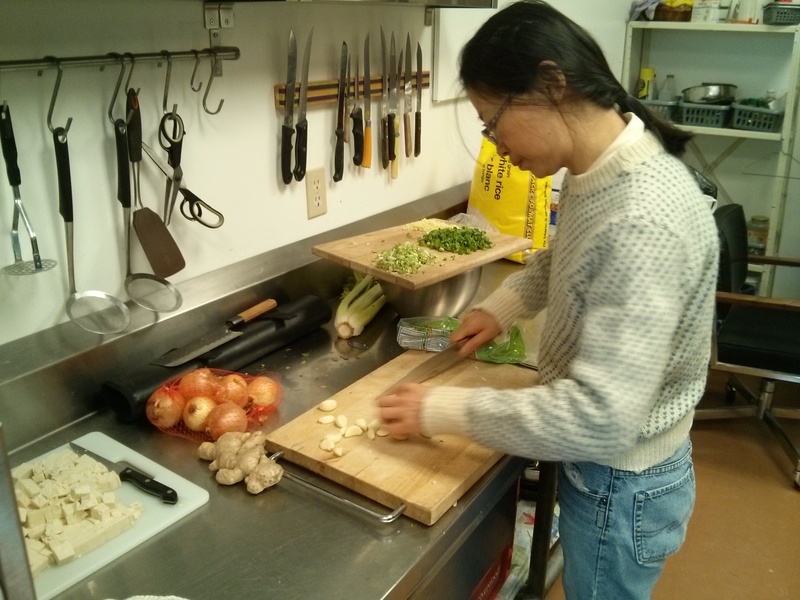 As part of her volunteer duties, Wendy comes up with the menu and identifies a few dishes suitable for 25 to 30 volunteers and clients to make together. 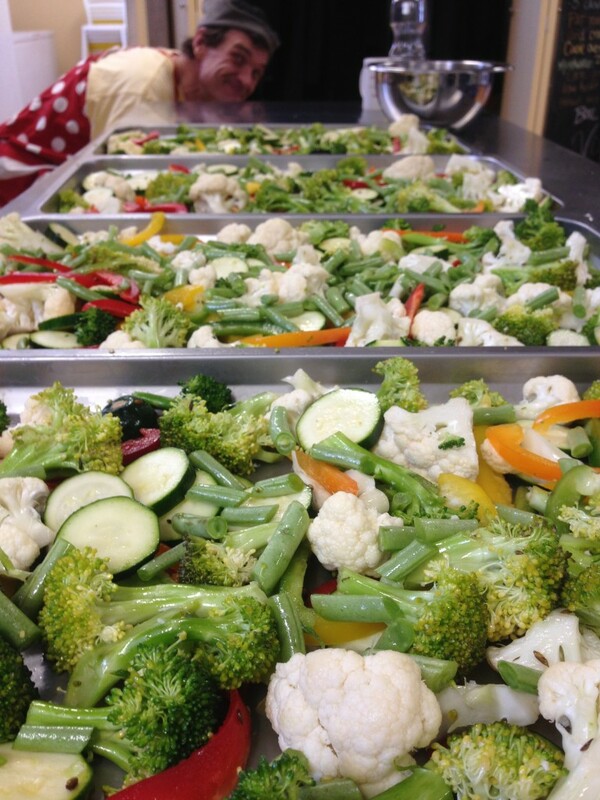 Preparation can include washing and peeling vegetables, cutting fruit, making dough and setting the table. Wendy loves watching people connect while they collaborate in the kitchen. 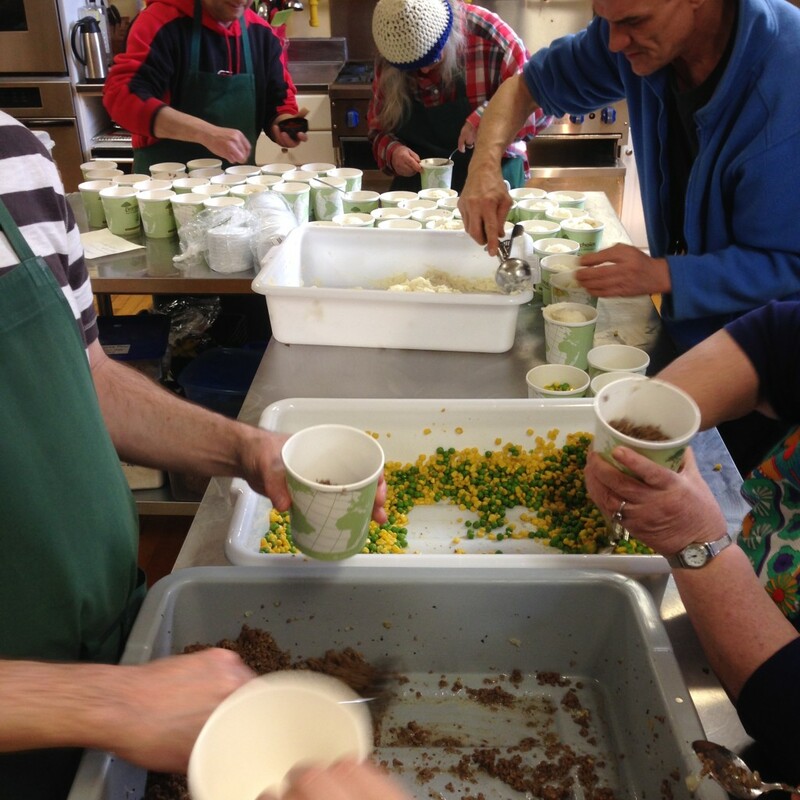 The community meals are about more than just providing good food for those who can’t afford it. They help people in need connect and socialize with their neighbours, fostering mental health as much as physical health. Repost of article from Citizenship and Immigration Canada’s daily internal newsletter Today@CIC. Published with permission. 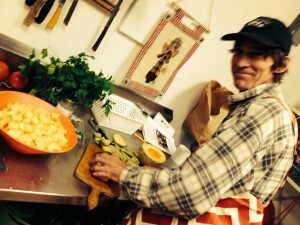 I was at the PFC for a Friday evening cooking class on April 10th. 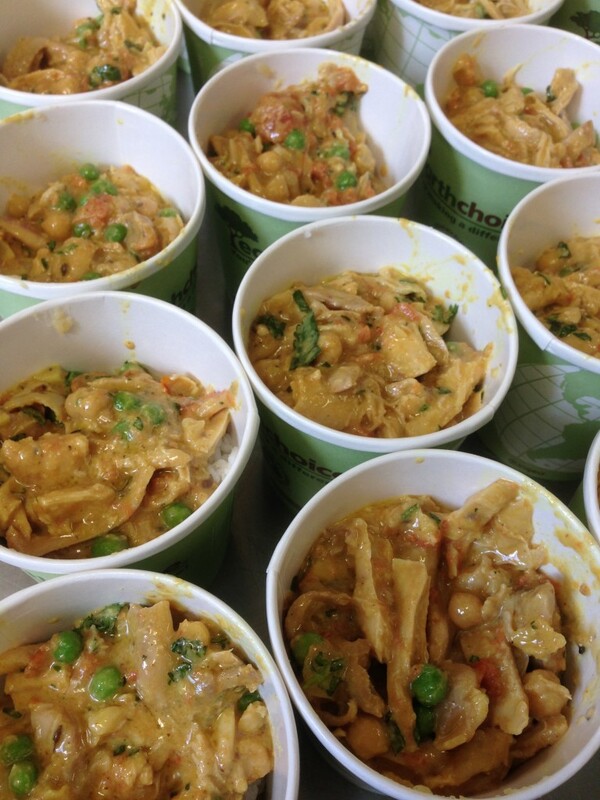 16 of us worked together on making the chick pea curry and so it didn’t take long for all the vegetables to be chopped, the chick peas to be rinsed, and the tinned tomatoes to be added to the pot. A few herbs and spices and it was ready for the crock pot. 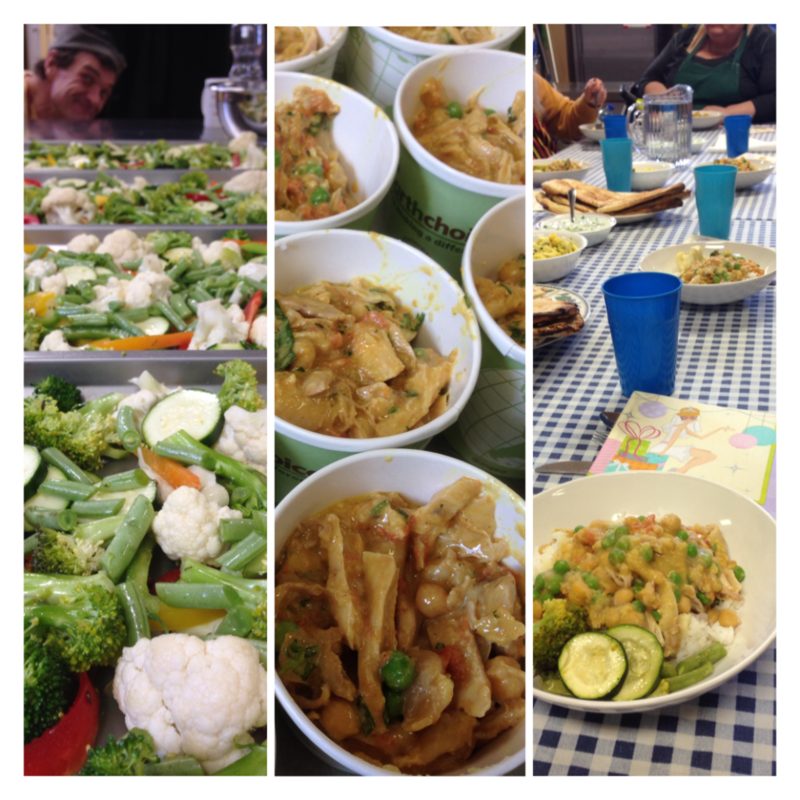 Sixteen of us sat down at one big table to eat a good nutritious curry with donated fresh bread. Vincent was the youngest at 3 years old; I’m not sure who was the oldest, I’m told its rude to ask these things! But even the magic of PFC can’t cook a crock pot curry that quickly, so we ate some curry that had been made earlier in the week. But there is some kind of miracle when people with all kinds of stories sit and share food they have prepared together. The conversations flowed easily and the sense of community was strong. Hub Anglican Church is sponsoring these Friday nights once a month. The PFC’s tag line is “Neighbour to Neighbour”, and after all, that is really close to Jesus’s tag line “Love your neighbour”. 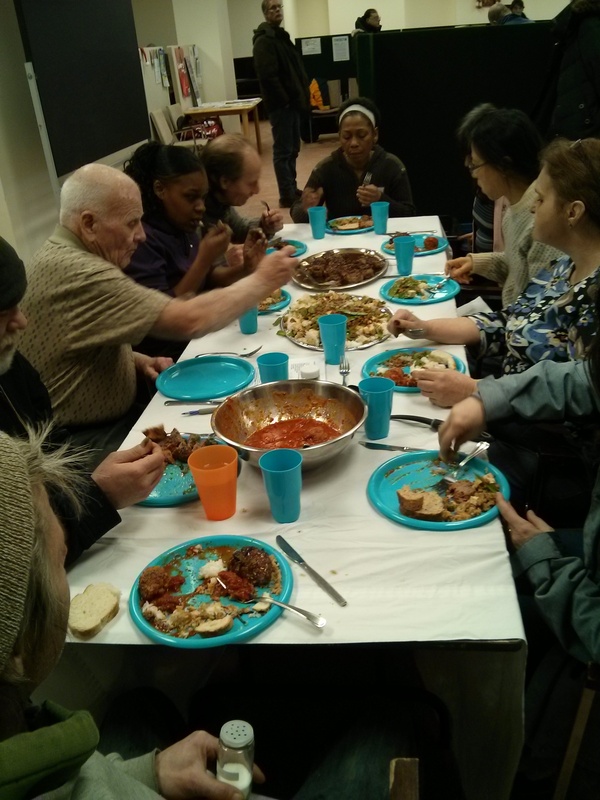 Making new friendships doesn’t have to be complicated, the food on Friday was delicious, good value and really simple to cook; and created space for people to build friendships and community. So what did you do Friday night? 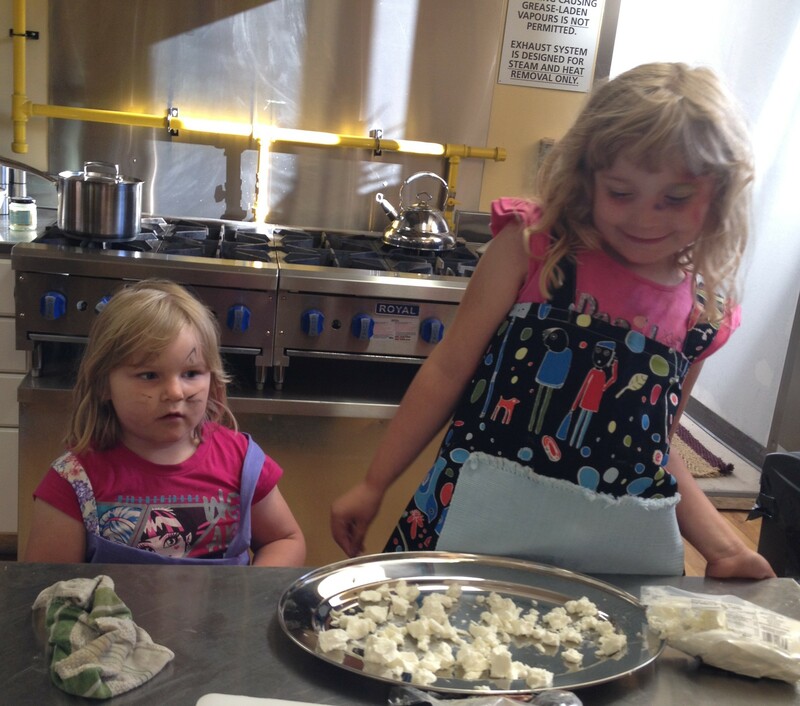 Look out for the next Friday evening cooking class in May and come and join your neighbours. Thanks to Alan Wickham, who wrote this guest post for us. 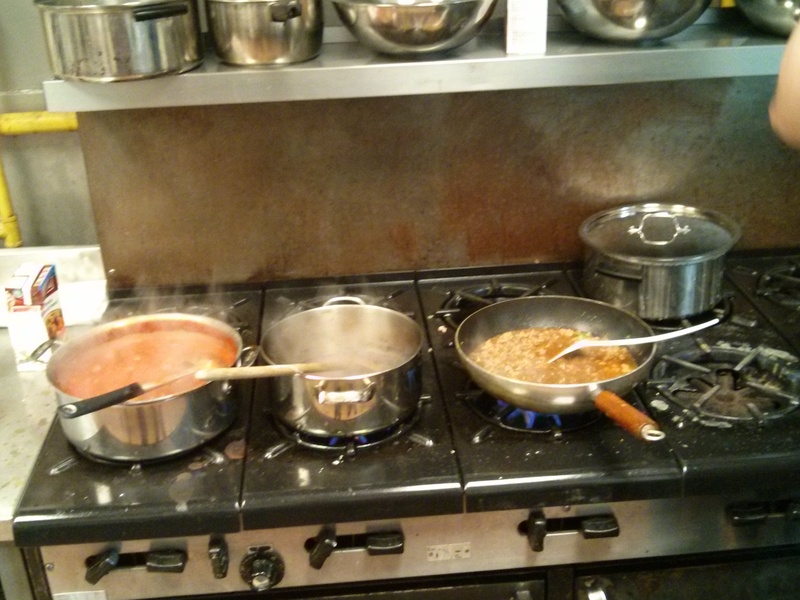 Interested in joining us for a Friday evening cooking class? Check our calendar and contact us to learn more. 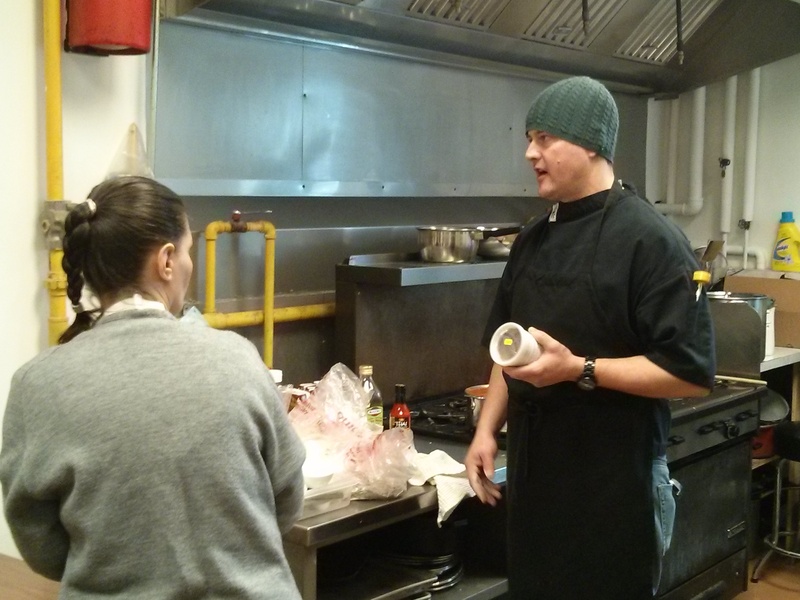 The moment Karen Secord mentioned the concept of the Collective Kitchen to me was the moment that I decided to stop paying lip-service to the ‘idea’ of volunteering. That conversation was a personal turning point and prompted me to make a commitment to dedicating time and energy in a program that I thought was brilliant. It aligned perfectly with my food industry skill set, and, having previously met some of the neighbours who rely on the PFC at a Crockpot chef demo/lunch, I was enthusiastic about being part of a progressive community organization that dedicated itself to supporting those in need through good food. 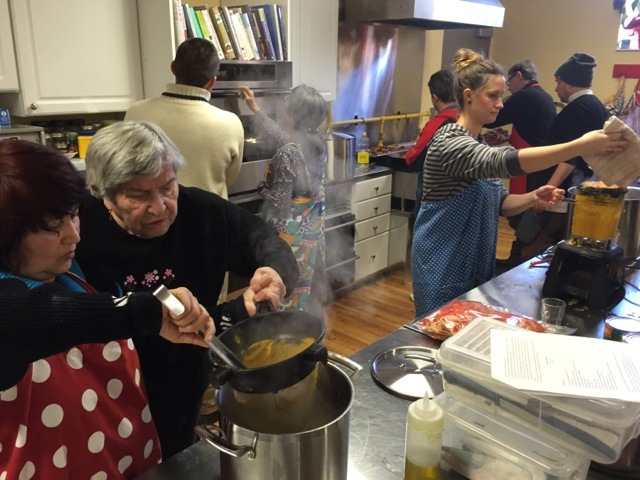 The essence of the program is for a group of participants to cook a casserole style meal in large quantity and package it into individual containers, thus allowing them several healthy frozen meals kept in inventory at the PFC and accessed by the neighbours as needed. Now that we are 6 sessions in, I realize that it’s about so much more than that. 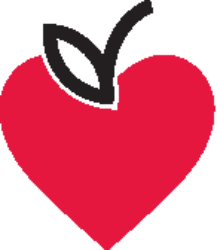 Generosity — The participants decided (and were quite adamant) at the first session that a portion of what we produced collectively would be made available for others in need who were not part of the group–those in need taking care of others in need. 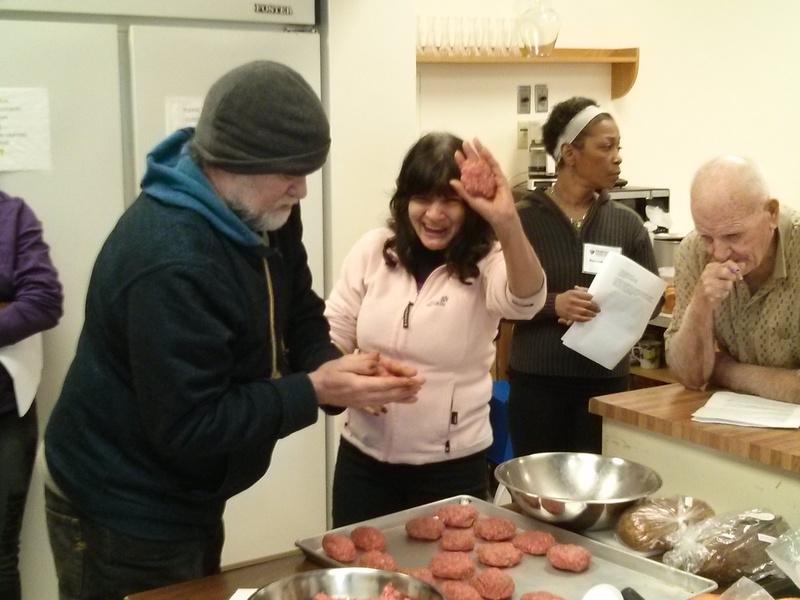 Learning — Laughter, debate, expanding cooking skills and food knowledge, collective participation from prep and cooking to packaging and clean up—all the neighbours take so much pride in their PFC kitchen and the opportunities if affords them. Confidence –– Some of the most valuable moments are to see various participants flourish, from quiet and introverted to confident and open, so very proud of what they’re accomplishing. Community — A meal at the end of each session allows us to acknowledge what we’ve achieved in a few short hours, discuss and plan what we might cook the next date, give ourselves ‘props’ for the deliciousness that we’ve created and share gratitude for the organization and people who make it all possible. 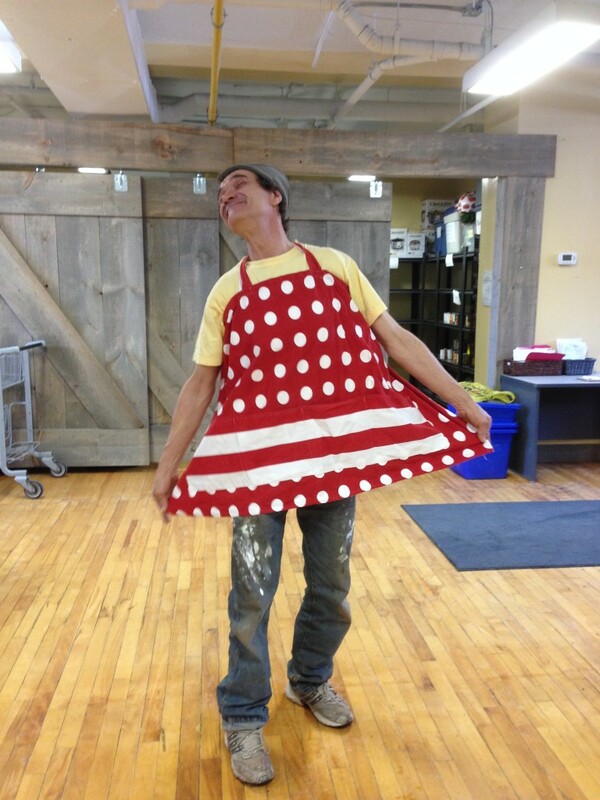 Thanks to Jo-Anne Laverty, co-owner of The Red Apron, who wrote this post for us about her Collective Kitchen experience. And huge thanks to the Trillium Foundation for providing us with the financial support that makes this program possible. 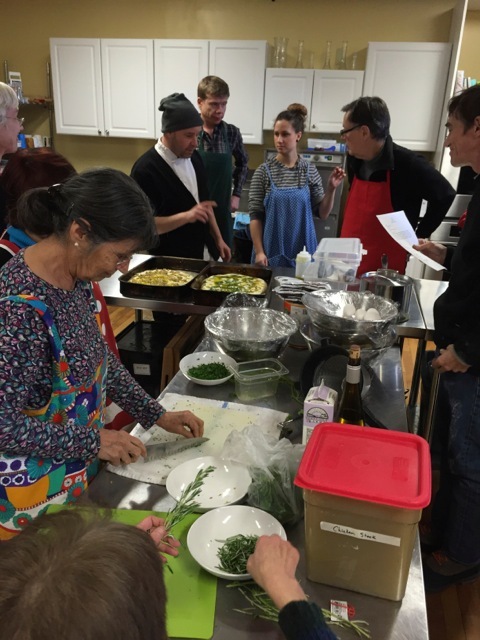 Last week, the Parkdale Food Centre hosted a cooking workshop with Patrick Garland, chef from Absinthe Café. 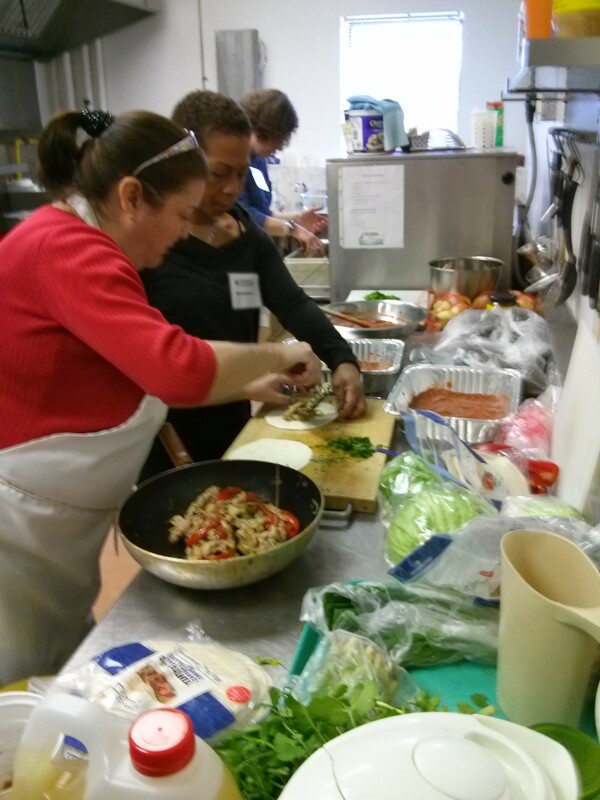 Twenty five people participated, making it the most well attended cooking workshop yet. The menu consisted of foccacia with herbs and olives, chicken cacciatore, carrot velouté and chocolate chip cookies. 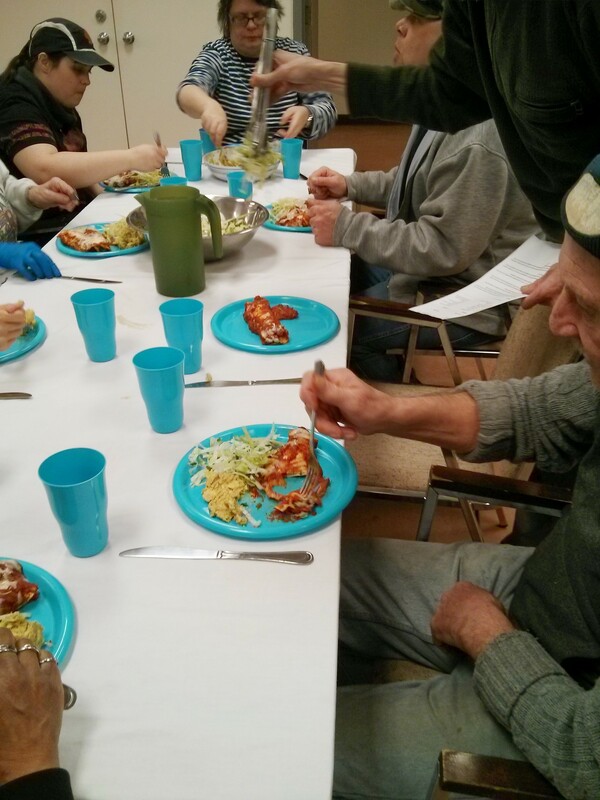 The workshop was lively and informative, and the resulting meal was simply delicious. Blending and straining the carrot soup to get the perfect texture. As one participant put it, “Food always tastes better when eaten with others”. We couldn’t agree more. 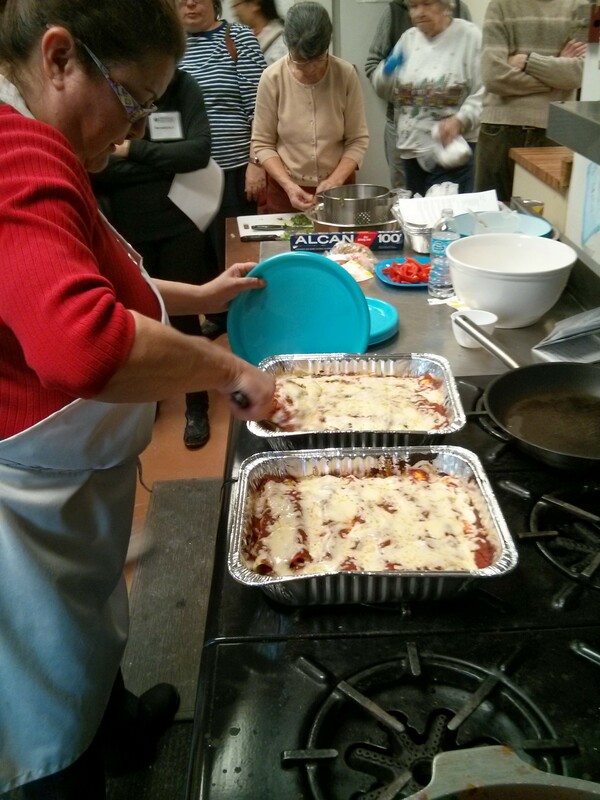 On October 7th, we hosted our monthly Italian cooking workshop with Tom Marcantonio. The kitchen was bustling with 12 in attendance and Sarah and Susan as the highly capable sous-chefs. 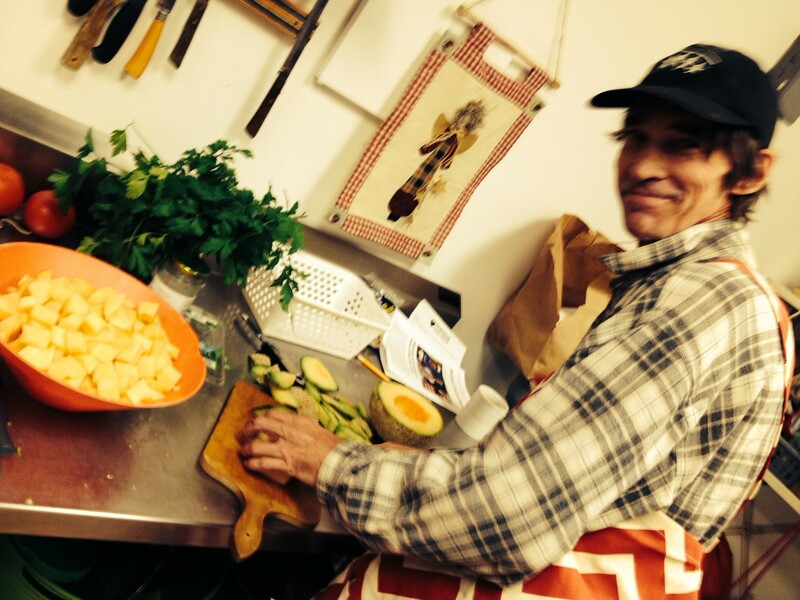 Tom had people chopping, assembling and sampling a variety of fresh vegetables, fruit, meat and cheese. The menu featured a mushroom bruschetta, Italian wedding soup with meatballs, a mixed green salad, penne with chicken, olives and tomato sauce, and fresh cantaloupe for dessert. When everyone sat down to eat what they`d help prepare, the room suddenly went quiet—a sure sign that people were enjoying their meals! Thanks to all of the volunteers who helped out, our neighbours who cooked and shared a wonderful meal, Tom who shared his culinary knowledge (and parsley from his garden), and John who did all of the washing up! We knew Darlene loved to cook and it was well demonstrated on February 20th, 2014 when Darlene Best unleashed her Mexican Fiesta. What better way to cure the cold winter blues with some great Mexican Enchiladas, fresh made Guacamole and Salad? It was the perfect cure. One thing we are getting very good at here is chopping. And there was lots of it going on. Cilantro, peppers and of course, the avocados. 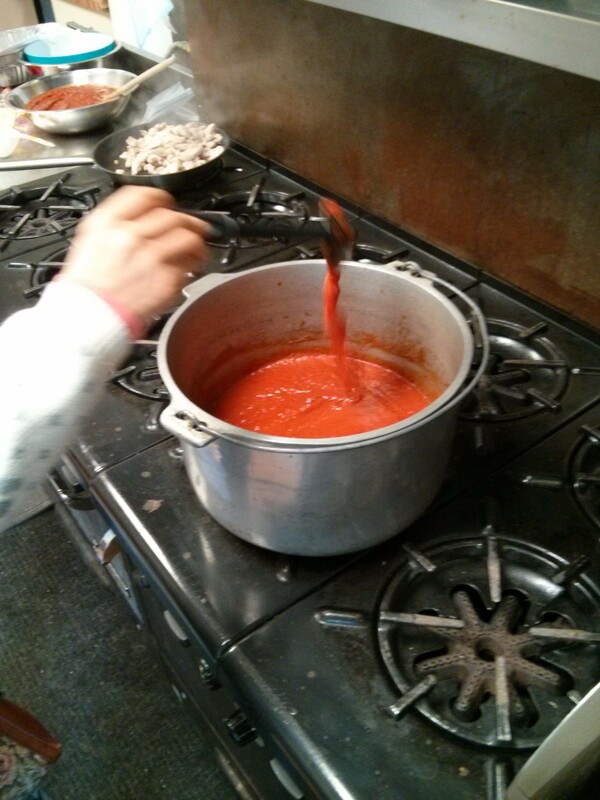 Darlene started with a well seasoned tomato sauce that included chili, cumin, oregano, coriander and garlic. As the sauce simmered filling the kitchen with a rich aroma, everyone’s appetites quickly increased. We next focused on the enchilada fillings which were surprisingly simple. Chopped up chicken thighs with the red and jalapeno peppers and some seasoning were fried and set aside as we got ready for the real work. The real work is stuffing and rolling all those enchiladas. And for the large hungry group (remember that great tomato sauce aroma) that was a lot of enchiladas. Darlene helped set up the production line and then we got right into it. A team effort soon had the first pan filled and waiting for some more sauce before going into the oven. After that, it was time for the guacamole which of course involves more chopping, only this time it was avocados. 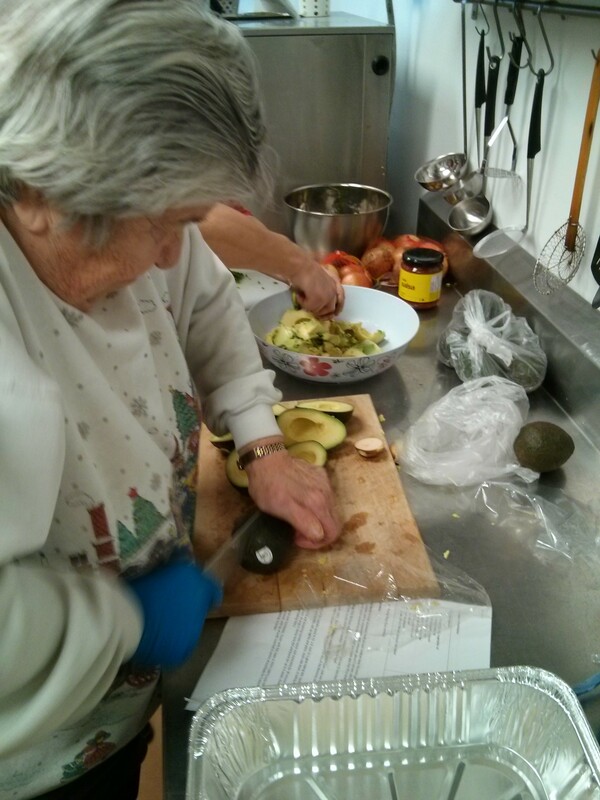 The avocados were no match for the Parkdale Food team. They were soon chopped, scooped, mashed and seasoned. The lettuce salad followed next. Just as we finished preparing the guacamole and salad, the enchiladas which had been covered in cheese and baked were ready and taken out of the oven. That delicious smell said it was time to eat. And eat we did. 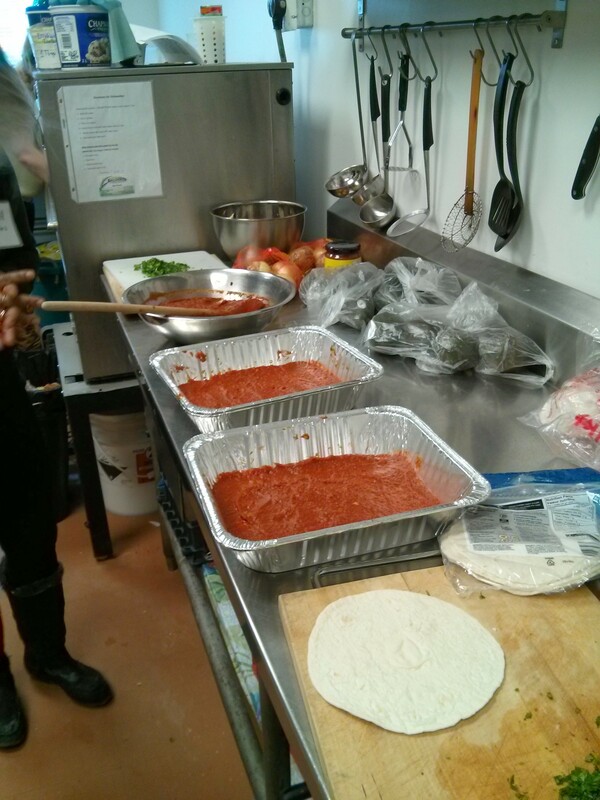 Hot enchiladas, fresh guacamole, a light tossed salad and of course, the great Parkdale Food team that helped with the preparation and cooking also helps with the meal. 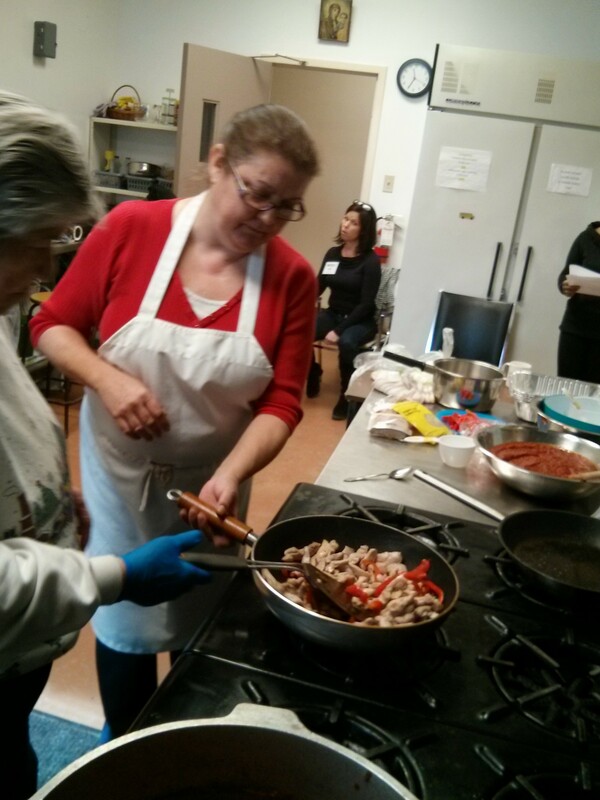 A big thanks to Darlene Best for a great cooking workshop! 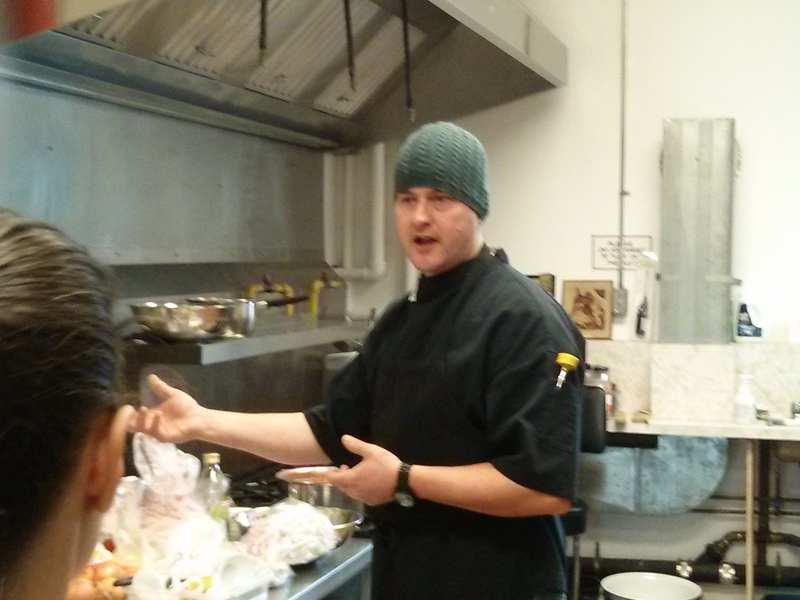 On Thursday, January 23rd, 2014, chef Jason Laurin of Essence Catering visited the Parkdale Food Centre to kick off our 2014 cooking workshop program. Jason had ambitious plans for the day with three recipes – Spicy Pork on Rice, Salisbury Steak and Onion Gravy and Meatballs with Tomato Sauce – planned out. The participants were ready, willing and hungry. The first order of business was chopping, and lots of it. We all gained an understanding of why chefs have sous chefs. It’s all about the chopping! Onions, celery, garlic, ginger and tofu (no fingers though) were chopped up. 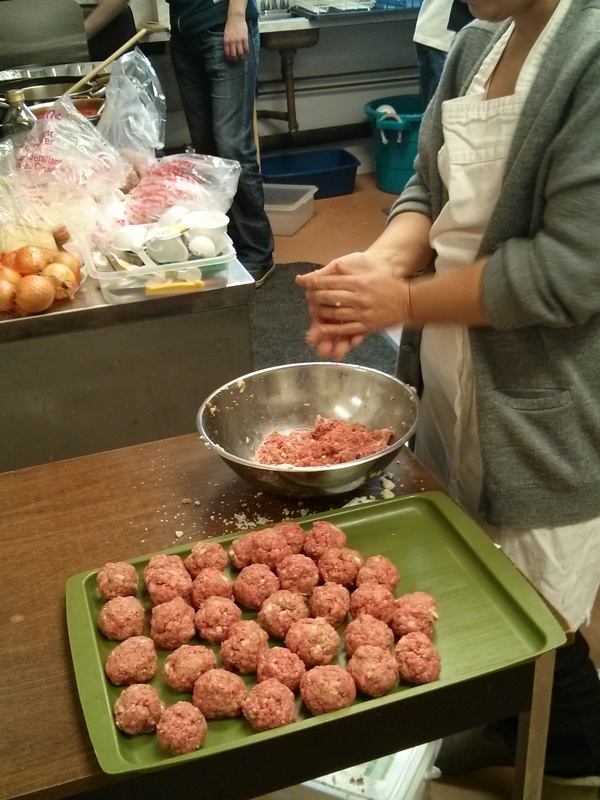 Jason also had two teams prepare the Salisbury steaks (beef patties) and meatballs, combining ground beef and pork in a traditional recipe for the meatballs. The Salisbury steak patties were ground beef seasoned with a few spices including Worchestershire sauce. It’s really the onion gravy that provides the extra flavour. 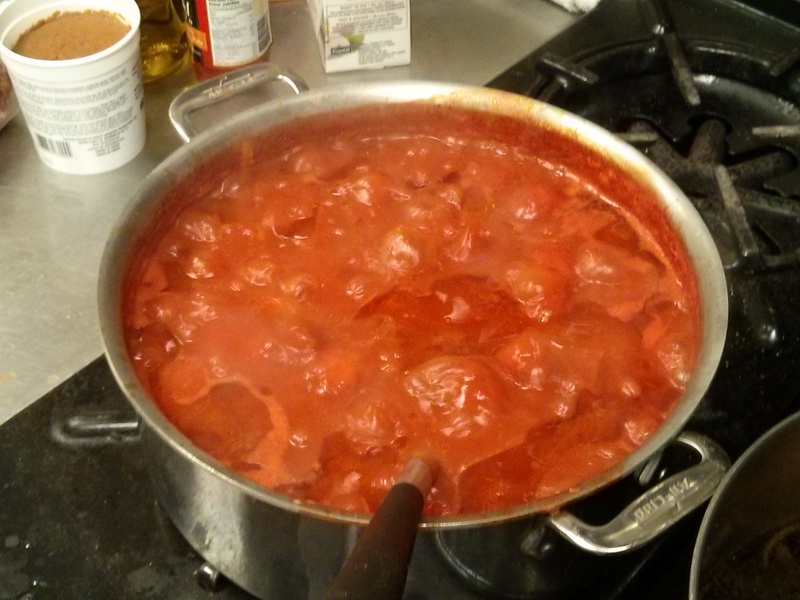 Jason worked with another group preparing the tomato sauce for the meatballs, frying up the onions for the Salisbury steak gravy and sautéing the garlic for the spicy pork. 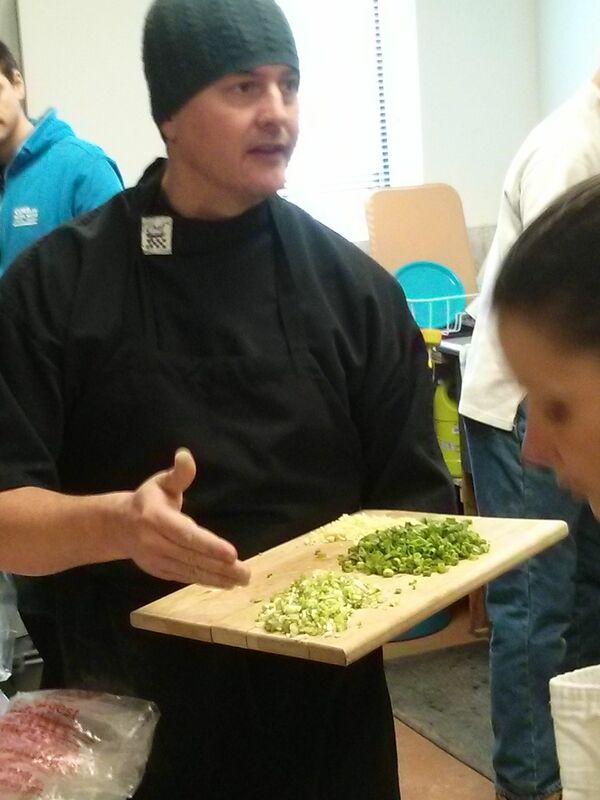 Amongst the all the cooking action, Jason took a few minutes to talk about chopping green onions and dividing them up, the whites to be cooked while the greens are used as an aromatic topping. It was a simple but valuable tip on how you take a simple ingredient like green onions and use it in a dish in a number of ways. He also highlighted the many uses of miso paste as an all-purpose seasoning. Jason is a great fan of Ottawa’s Chinatown, visiting often for ingredients and seasonings like miso paste. Finally, he let us in on three tips for great tomato sauces – lots of oil, a good can of tomatoes and a long slow cook of at least two hours. It really did make a difference. With the sauces and gravy under control, Jason and the team turned their attention to the meatballs and Salisbury steak patties. The meatballs went into the sauce while the patties were first fried and then put into the oven to finish cooking. 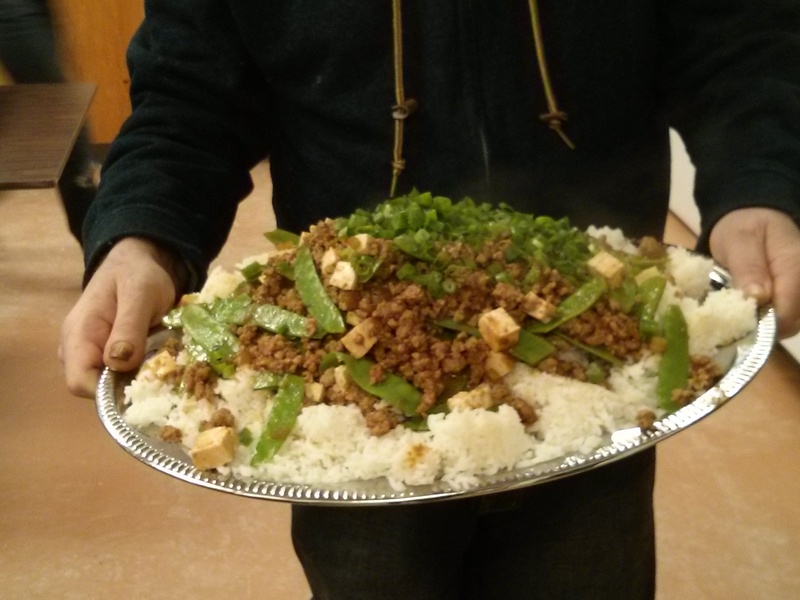 Once the patties were in the oven, Jason turned his attention to finishing off the spicy pork, adding the ground pork to the sauce and cooking it. It was not long before the three meals were ready and we had reached the most important and anticipated part of the workshop, the communal meal. 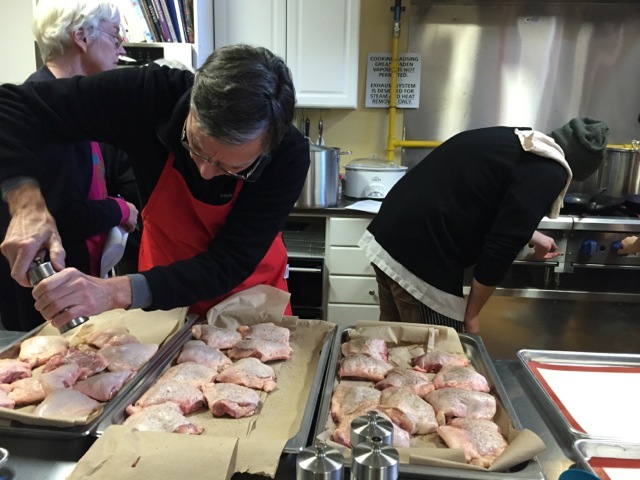 The cooking workshops are more than just an educational experience – they’re a chance for the participants to sit down together and enjoy the food that they prepared. Everyone chatted, laughed and ate a great meal with new friends. As for the ultimate review on Jason’s choice of recipes that day – all the platters were empty by the time we finished. 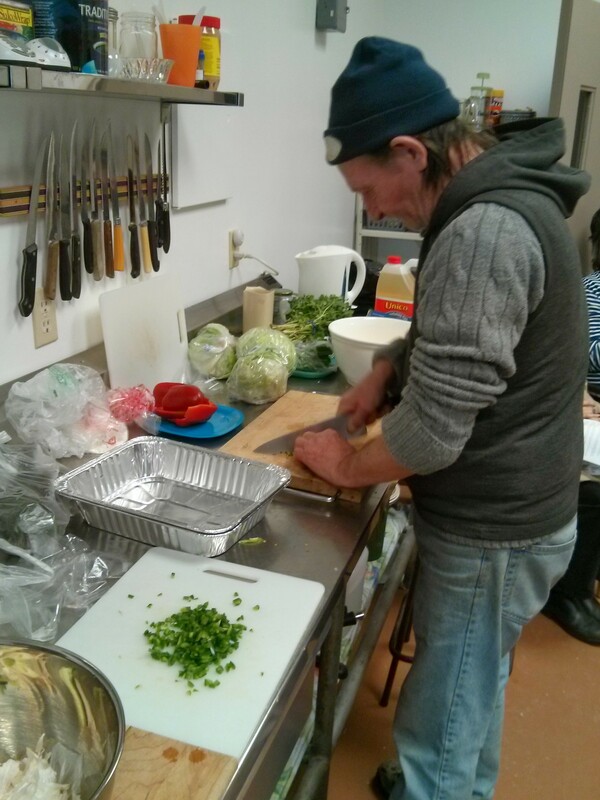 The Parkdale Food Centre wishes to extend our thanks to Jason Laurin for his help leading the workshop, the participants who so enthusiastically joined in and of course, all our volunteers who helped make it happen (and helped clean up afterwards) . 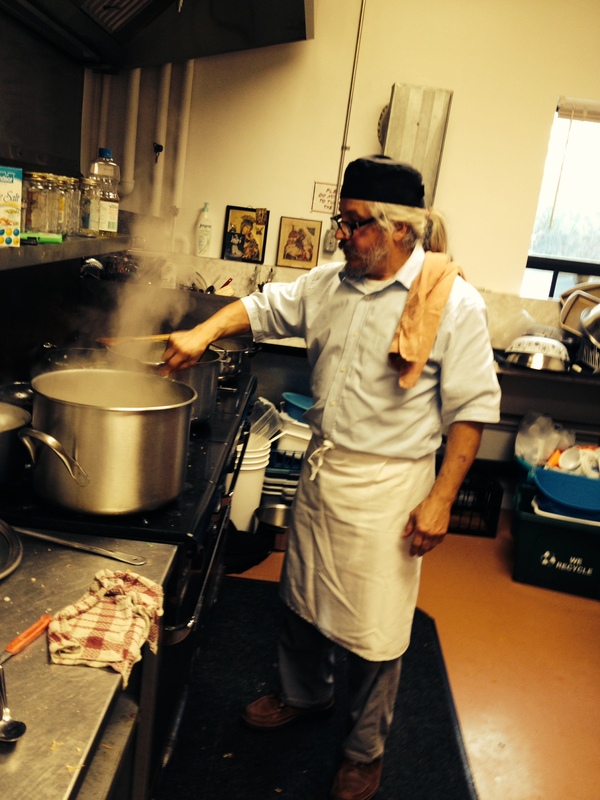 We hold the workshops every month and greatly welcome donations of new crock pots, money for the ingredients or sponsorship of a workshop. 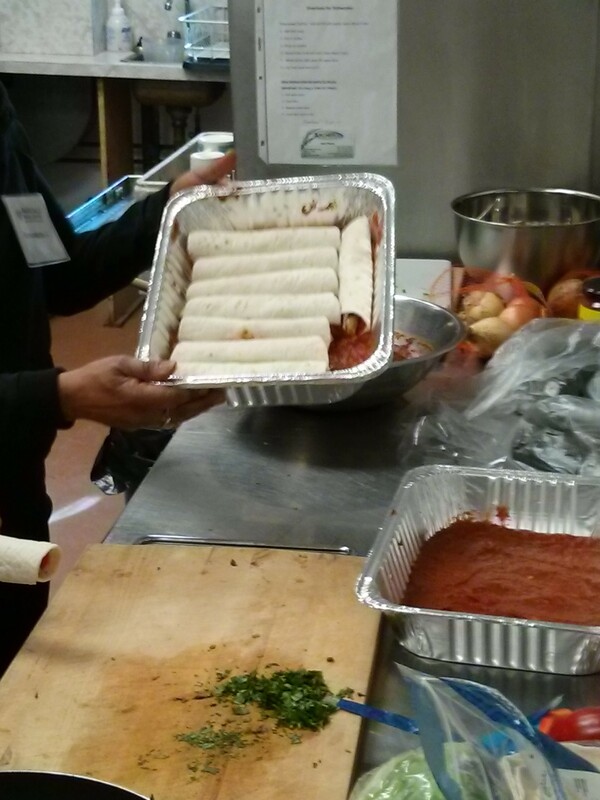 To learn more about our cooking workshops, visit our Cooking Workshops page and learn how you can help.